Gravity Consulting: Hudson miracle? Thank the system! Hudson miracle? Thank the system! What happened on New York’s Hudson River on January 15, 2009, was not a miracle, proclaimed Jeff Skiles. 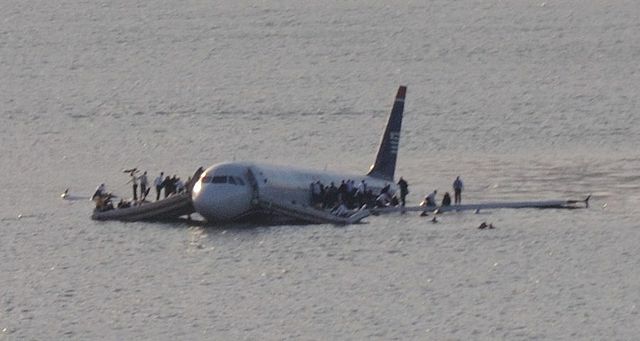 As First Officer on US Airways flight 1549, which ditched in the river a little over five minutes after taking off from La Guardia Airport, he should know. That whole short but dramatic episode is, of course, now the subject Clint Eastwood’s feature length film, Sully, after the Captain (Tom Hanks) on the flight that was quickly dubbed the Miracle on the Hudson, when all 155 passengers and crew survived. Skiles was speaking at the annual conference of the EuropeanRegions Airline Association, in Madrid, this morning – three years almost to the day since Doreen Walsh, senior flight attendant on the Airbus A320, delivered an electrifying speech to delegates at that year’s conference, in Salzburg. The point that Skiles was making was that, while Hollywood of course likes its heroes, the survival of all on board the engine-less aircraft was down less to heroic individual action and more to the sea change in the airline industry’s approach to safety that has taken place over the past 20 or so years. To recap, flight 1549 was just two minutes old when the Airbus ran into a large flock of Canada geese, fatally ingesting two of the hefty birds into the very core of each of its engines. Three and half minutes later, with Capt Chesley Sullenberger at the controls, it ditched in the unusually tranquil and boat-free waters of the Hudson. He then went on to sing the praises of the industry’s collective response to safety – a response, he said, that was responsible for the survival of 155 people that day. A response in which many different individuals had a critical role. He and Sully, for sure, but also the three cabin crew, all the passengers (none of whom acted irresponsibly during the crisis), air traffic control, the river ferry crews, the police helicopter rescue team, the operations and training teams at US Airways. The list goes on. As a consequence, an airline that had suffered five fatal accidents in as many years, has recorded no such incidents in the subsequent 15 years. It is the advent of Crew Resource Management training – developing cooperation and the sharing of workload among all members of the on-board team – that has delivered the remarkable standards of safety that we recognise as the norm across all levels of aviation today. It is thanks to the CRM approach that travelling by air remains today the safest way of getting from A to B. Prior to CRM, said Skiles, Sully would not have been able quickly to take control of the aircraft and delegate a litany of checklist-based tasks to Skiles. He would have wilted under the sheer weight of tasks facing him, while his first officer sat in the right-hand seat twiddling his thumbs. Curiously, before I had seen the conference agenda and while sitting on my easyJet flight out to Madrid, I read the most detailed report I have seen on the tragic fate of Air France flight 447, which stalled at altitude and crashed into the South Atlantic later in 2009, killing all 228 on board. In theory, this terrible crash is precisely the kind of accident that CRM should render close to impossible. The report, in the Guardian, was looking at the flaw in the presumption that, in an increasingly automated age, humans are there to take over when it all gets too much for the computers that run systems. Rather, it suggested, computers might better take over operations when things get too much for finitely resourced humans. Like all accidents, flight 447’s demise came about because of an extraordinary coincidence of many different events, none of which of its own should have been sufficient to bring down the aircraft. Critically, of three men who should have been sitting at the front of the aircraft at the time, the captain was probably unfit to fly through lack of sleep and was not at the controls. Of the other two, one was young and inexperienced and the other had few recent flying hours, having recently moved to a management position. I asked Skiles for his views as to how such a tragedy might still happen in these days of CRM. To paraphrase his response, the issue is that pilots may have learned to operate the computerised flying machine, but they haven’t necessarily learned to fly. Partly as a consequence of this, pilots are now encouraged to disconnect the autopilot during flight and, yes, actually fly the plane themselves. “I think it’s very beneficial in maintaining my flying skills,” said Skiles. In the Air France context, the young pilot at the controls – had he had a better understanding of what was keeping the aircraft in the air (or not) – might not have pulled back on the control stick and caused the aircraft to stall. And the team, collectively, might have more quickly worked out what was actually happening to their aircraft. And 228 people might have, indeed should have, survived. The Air France incident remains very much the exception rather than the rule, and the truth of everything Skiles said about safety management systems and CRM is borne out by the airline industry’s exceptional safety record. That is as true among the smaller companies represented by the ERAA as it is among the so-called legacy carriers and other large airlines. And that exceptional record is achieved despite the near-constant commercial uncertainties of an industry in which return on capital deployed is at best marginal. In this regard, the ERAA, under the stewardship of the immensely capable Simon McNamara, has been able to report flickering lights of hope on the horizon for an industry that has been buffeted by the world’s general economic woes in recent years – and which currently faces new uncertainties posed by Brexit (a Europe-wide issue) and unpredictable dollar-based fuel prices. McNamara’s good news is that the association’s 52 member airlines are operating eight per cent more routes this year than last, have increased their overall capacity by five per cent, and have new aircraft on order equivalent to nearly ten per cent of their total fleet. It’s an industry that stands very much on its own feet, without subsidy. To have also achieved such immense strides in safety is a further endorsement of its continued resilience.